Manna Park is a perfect holiday venue for group accommodation, such as a group of friends, a family gathering, schools, youth groups or community group. Manna Park can accommodate up to 50 people, in four family rooms and four hostel rooms. Each hostel room has bunk beds to host eight to ten people. Each of the four family rooms, contains a queen size bed and two single/bunk beds. 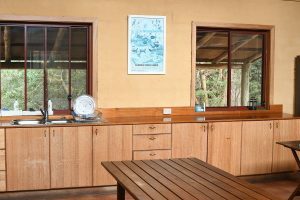 The two large mud brick & timber buildings include 2 large fully equipped kitchens, rooms for group meals and common rooms with wood heaters. There is a modern laundry and BBQ facilities. The hostel is designed to cater for Disabled access. In front of the accommodation there is large, open grassy area which is ideal as a playing field for sport and outdoor activities. The Hostel has also a solar heated swimming pool.